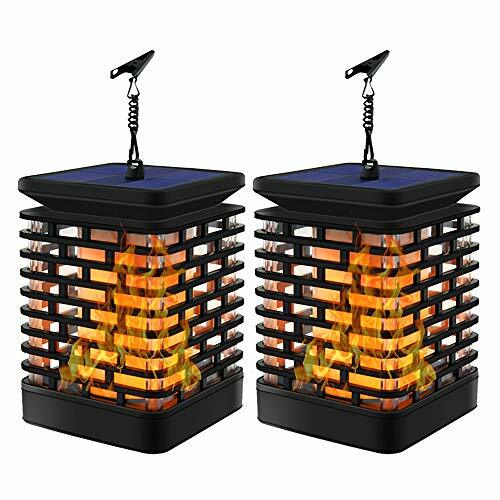 [Solar Flame Lantern Lights] 2018 New Solar Flame Lights , with update LED chips , more stable , more beautiful and looks like real flicking flame , the best decoration light for your garden , yard , pool , pathway etc. [Durable & Waterproof] High-quality ABS plastic material , 99 LED ,IP 65 Waterproof rating , suitable for all kinds of weather , could hanging it out all year long. [Energy Saving & Environmental Protection] High efficient solar panel , built-in 1500mAh rechargeable battery , it will automatic charging at daytime for 8 hours , and it will be light on automatically at weak night for 8 to 10 hours , please pay attention : working time will be influenced by the weather , please hanging the lanterns under the sunlight. [Easy to Install] The Hanging Light including a clip and a chain , you could hang it on tree , place it on fence , anywhere you like. [NO Risk Purchase] We provide 1 year Manufacturer's Warranty and 30 days no-questions-asked return policy . If you have any problem , please be free to contact us at support , we will give you a satisfactory reply within 12 hours.